In the evening of 1 May 2016, Sirawith went to sky walk near BTS Chong Nonsi to taking part in a Post-Sith (post right) activity to campaign for freedom of expression and for the release of 8 admin of We Love Gen. Prayuth facebook page who were held under military custody. Sirawit Serithiwat or New was originally from Nakorn Ratchasima. He enrolled the Politics and Government Program at Faculty of Political Science of Thammasat University. The first couple years in university, he worked with the University Student Council then later joined the Dome Front Agora Group. He was the leader calling for justice regarding the overpricing of the university's canteen. Sirawith ran for the president of the Student Union but not succeeded. He was also a part of the parade organized by the famous Thammasat University Political Satire Group. In the evening of 1 May 2016, police officers arrested Sirawith from the BTS skywalk and took him to Thungmahamek Police Station after he threw post-it on the skywalk floor. At 4 pm, Matichon online reported that Resistant Citizen Group gathered people who are interested in “Post-Siht” activity to write the people’s declaration of freedom at the Skywalk, Chong Nonsi BTS station. Prior to the schedule, a hundred of police officers from Thungmahamek and Yannawa Police Stations guarded the area with barricades. An officer from the UN human rights office was also present at the scene as an observer. At 16.15 pm, Sirawith arrived at the scene and told the medias that although the activity area was public, it could not be used due to the blockade, so we needed to wait for the authority. He added that overcoming the problem using violence would not bring peace and further questioned whether the referendum would still be conducted even there was no freedom. During the interview, the police asked him to continue his interview at the police station. Sirawith denied that he had not yet done anything then why did he had to go to the station. Nonetheless, as Sirawith was surrounded by the police that he was unable to move or continue the activity. He finally distributed a pile of Post-It note on the ground and called everyone to collect them. 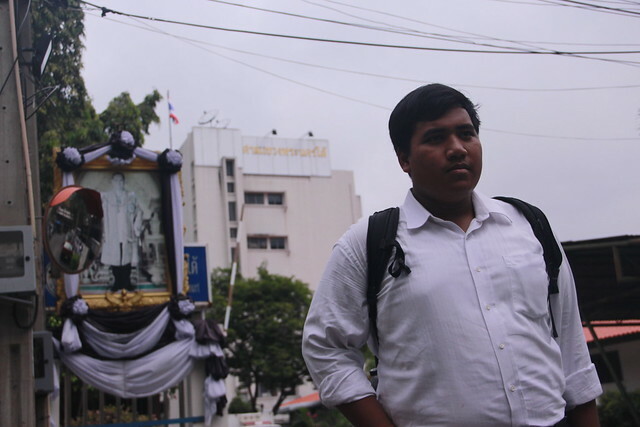 He then was detained to Thungmahamek police station. At 16.30 pm, Prachachart Online reported that the inquiry officials had questioned Sirawith for 5 hours with the presence of Arnon Numpa, a lawyer of the Thai Lawyers for Human Rights. There were about 100 people, including the media, awaiting an update in front of the station. New was preliminary charged for dropping refuse or waste onto a public place. He denied all the charges. At 10 am, Sirawith, as the defendant, reported to Bangkok South Municipal Court upon the trial appointment. The Court proceeded to repeat the accusation and call the parties to submit evidences. The defendant thereby submitted 7 documentary evidences. The plaintiff stated that there was no evidence to be submitted at that time, however, told the defendant that the evidence was available to be examine upon their request. The defense lawyer then objected the plaintiff’s non-submission and requested the Court to record the objection in the casefile. Further, the plaintiff requested the testimony of six witnesses. The defendant requested the testimony of four witnesses. The Court then scheduled the hearing on 14-16 December 2016. At 10 am, courtroom No.7 of Bangkok South Municipal Court, the decision was read. The Court found the defendant guilty of dropping refuse or waste onto the road or waterway according to Section 32 of the Sanition Act, to be subject to a fine not exceeding THB 1,000. The Court reasoned that the Defendant did not need to throw or strew a pile of Post-It note on the ground in order to distribute them for the activity. Such strewing indicated the defendant’s intention as if it was not being collected completely, it would become waste. Also, as the act was committed at the Skywalk of Chong Nonsi BTS station, it was considered a dropping refuse or waste onto a public place. Therefore, the Court ruled the Defendant guilty and ordered the Defendant a fine of THB 1,000. The Defendant paid the fine and prepared to further appeal the Court’s decision. The Bangkok South Municipal Court read a verdict from the Court of Appeal reaffirming the verdict from the Court of the First Instance. Sirawith was found guilty under Section 32 of the Sanitation Act and was fined for 10,000 baht. The Court of Appeal reasoned that the defendant's claim of an unauthorized officer who arrested the defendant, all of the plaintiff's witnesses testified in the same way that there was no arrest, just an invitation to the police station. This claim was therefore dismissed. For the post-it paper that was seized by officers, the defendant claimed there is no legal power to seize, the court sees that if officers did not prevent the crime, the defendant would use it to commit more crime. This claim was therefore dismissed.